Please remember: all Showroom4cars.com prices are guaranteed in Sterling, and include 12 month's VED and 1st registration fee, together with delivery into the UK. 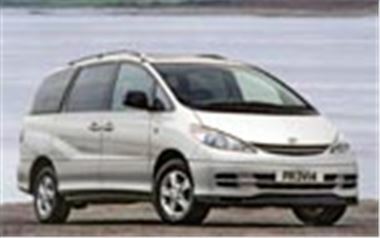 TOYOTA PREVIA 2.0 D4-D CDX 7 SEATER. S4C price £20,999.00. Silver & Blue Metallic, Full 3 Year Toyota Warranty. TOYOTA PREVIA 2.0 D4-D GLS 8 SEATER. S4C price £19,499.00. Choice Of Metallic Paint, Full 3 Year Toyota Warranty. European supplied. TOYOTA PREVIA 2.0 D4-D GS 8 SEATER. S4C price £17,999.00. REPEAT £17,999.00 (LESS THAN £18,000). Choice Of Metallic Paint, Full 3 Year Toyota Warranty. European supplied. TOYOTA PREVIA 2.4 CDX 7 SEATER Auto. S4C price £21,499.00. Silver Steel, Full 3 Year Toyota Warranty. European supplied. New Shipment: Now available in red, silver, black and blue metallic. Renault Clio 172 Sport. Immediate Delivery. S4C price £11,999.00. Renault 2 year manufacturer warranty. European supplied. Limited Availability, so hurry. More information from www.showroom4cars.com or by calling the sales hotline on 0870 753 4444.